Example 7: EDIHN induces new hair follicles in human skin. Grafting. Discarded human adult scalp from the preauricular area obtained from plastic surgery was grafted onto immunodeficient (scid) mice. The graft was bandaged and allowed to heal, then was used in the wound healing study 3 months after grafting. Results: To determine whether human skin responded to EDIHN as did mouse skin, human skin was grafted onto SCID (immuno-defϊcient) mice and subjected to depilation by plucking and wound induction three days later. Seven days following wound induction, formation of new HF was observed in the human skin (Figure 2 IA; arrows indicate new HF) by hematoxylin and eosin staining of paraffin embedded tissue sections. 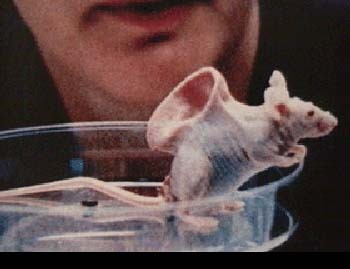 In additional experiments, adult human skin was grafted onto mice, abraded, and examined at 7 days post-abrasion. New HF were generated in the human skin, which mimicked normal hair follicle formation during fetal development, as evidenced by staining for S100A6 or S100A4 (Figure 21B). What this means is that hair GERMS were detected in human skin. One would not be seeing hairs sprout at this time, that would be a few weeks later for certain. Probably 3 weeks or so later anyway. This is the verbiage I thought was “essential” as to know what they are doing. This is an incredibly defensively written patent. They are attempting to patent any and every possible embodiment as to make sure no doctors can perform this and not pay Follica royalties for it. Some of the stuff in the patent probably wouldn’t work or help at all. ■ …characterized by detachment of the scab. Depending on the depth of the abrasion process, it may be desirable for the compounds of the invention to be administered or activated prior to or after the detachment of a scab. Alternatively, hair follicles may start to form before the scab falls off, in the case of, for example, dermabrasion. The state of reepithelialization can be induced. Methods of inducing this state include the disruption of the subject’s skin at the location where the compounds of the invention are going to be administered. Disruption can be achieved through abrasion (e.g., the rubbing or wearing away of skin), or through any method that results in disturbing the intactness of the epidermis or epidermal layer including burning (e.g., by inducing a sunburn) or perforating the epidermis or epidermal -layer: The disruption can either result in partial or complete removal of the epidermal layer at the intended location. The disruption of the epithelial layer can be accomplished, for example, through mechanical, chemical, electromagnetic, electrical, or magnetic means. Mechanical means can be achieved through the use of, for example, sandpaper, a felt wheel, ultrasound, supersonically accelerated mixture of saline and oxygen, tape-stripping, or peels. Chemical means of disruption of the epidermis can be achieved, for example, using phenol, trichloracetic acid, or ascorbic acid. Electromagnetic means of disruption of the epidermis can be achieved, for example, by the use of a laser capable of inducing trans-epithelial injury (e.g., a Fraxel laser, a CO2 laser, or an excimer laser). Disruption can also be achieved through, for example, the use of visible, infrared, ultraviolet, radio, or X-ray irradiation. Any of the previously mentioned means of disruption can be used to induce for example, a burn, excision, or microdermabrasion. Here the skin is not contacted with any substance until, for example, the ■ •■ - epidermal disruption -has healed (e.g., any time between 2 days and 3 weeks). Alternatively, the skin can be contacted with a cast or bandage (e.g., resulting in increased blood flow to the disrupted skin or decreased transdermal water loss or decreased mass transfer of gases into the skin and from the skin (e.g. oxygen, carbon dioxide, water vapor), decreased heat transfer from the skin (e.g. resulting in an increased temperature of the skin surface) or increased pressure on the skin. Prior to disruption, the skin can depilated or epilated. The depilation or epilation can be accomplished through, for example, waxing, plucking, an abrasive material, a laser, electrolosis, a mechanical device, or thioglycolic acid. The disruption of the epidermis can be induced between 3-12 days (e.g., 4-12, 5-12, 4-11, 6-11, 6-10, 6-9, 7-8, 5-11, 5-10, or 7-10 days) prior to the addition of the compositions of the invention. I think FIVE DAYS because hair germs were detected in human skin at day 7. They probably started forming by day 6 at the latest. • Removal of the stratum comeum through removal of the first 10-30 μm of dead skin cells. There are a few immunosuppressants in the patent mentioned as possibles. Due to the fact that they mention immunosuppressants in the opening paragraphs, I’d bet they are going to include a topical immunosuppressant in the patent. It might not be cyclosporin, but it will probably be one of them. The human immune system and androgen levels are the only things different for experimental purposes in human skin grafted onto a SCID mouse and actual people. They are trying to account for this by using both anti-androgens (Dutasteride probably for about two weeks) and a topical immunosuppressant. Maybe I need to look again…but I didn’t see wnt or lithium mentioned in the new patent. Perhaps blocking EGF receptors, immunosuppression topically, NO-agonists, opening potassium channels, anti-androgens, and FGF-growth factors will be “enough”. If that is the case…this really would be fast-tracked even if the FDA wanted to look at it. Someone (hint) could take some garlic supplements the week or so they use the topical and probably augment the process (garlic has a little lithium) or use lithium chloride as a table salt for that week (it used to be used for that, but over long periods has some toxicity internally) and better their chances of growing more hair-if this indeed will work in humans. Im not saying this will work mind all of you, but I am saying that the University of Penn’s dermatology department which includes Arthur Kligman and George Cotsarialis seems to think that it will. I just hope it can make more hair in the donor area and especially on donor scars. It at least gives us something to be excited about. If it weren’t for Follica at this point…I wouldn’t even be looking at the forum until late September and then next year during the third quarter. They are able to regrowh human hair on human skin grafted on the back of a mice, right? why then don’t put out those hair from the mice’s back (as technique FUE does) and just transplant on a dude like a classic transplant? The PETA people would go apeship if one even began to do this. Mice dont live very long anyway. Two or three “harvest” and the poor little critter would be dead. Youd’ have to transplant some of your own scalp skin to the little fella also—but its a moot point. Its not going to happen. » little fella also—but its a moot point. Its not going to happen. we can just use 2-3 mice per head, mice are currently used to grow ears, why not use them for hair? Do you think Stephen Foote’s theory would point to something else that is different? I seem to recall (but don’t remember exactly) that his hypothesis was that the lymphatic drainage system was involved. » of dead skin cells. Looks like disruption of the epidermis layer is the key to their patent. I’ve been mentioning scalp peels to rejuvenate the skin for a while and it seems like they are doing the same thing. Stratum corneum is the topmost layer of epidermis so anyone with one of those home peeling kits can do it themselves. The link above talks about how chemical peels rejuvenate skin and such. I’ve got the Neutrogena Facial peel (they say its about as effective as glycolic 20%). Tomorrow, I’ll be done with a presentation then I’ll put it over my scalp and see what happens. As of the WNT pathway, this is a separate patent right? or update to the original? First one covers their WNT technique, this one cover others…yeah it does look like they are trying to patent as much variations as possible. » hypothesis was that the lymphatic drainage system was involved. Foote’s theory is bogus. There is another mouse experiemtnt with RU59941 in which balding hair follicles were transplanted to mice, and only 2% regrew without the RU58841 (the control mice). According to Foote’s theory, these hairs should have grown just fine, being removed from edema and all…and having tissue scaffolds to protect them, but they didn’t. THe RU58841 mice, who didn’t have enough RU58841 applied (they used something like .01% or something way too small, I cant remeber) only regrew the hair 28% of the time. Again, If Foote’s theory was right, they should have regrown all of their hairs. Its a moot point, and probably why Stephen left the forums. » » little fella also—but its a moot point. Its not going to happen. » why not use them for hair? It will not be legally allowed, animal rights people would have a cow if they know a bazillion lab mice were having human skin grafted onto their backs and were dermbrated repeatedly factory-fashion so you could have hair. It would also be very expensive and extremely labor-intensive. Its not going to happen, so why worry about it. » » of dead skin cells. » Looks like disruption of the epidermis layer is the key to their patent. » The link above talks about how chemical peels rejuvenate skin and such. » over my scalp and see what happens. You are messing up big time, I can tell you have not read these patents thoughoughly. It would be best to just wait for Follica. There is a hell of alot more to what they are doing than just abrading the skin. The healing is managed and a adjuvant solution or internal in prepared. You need a EGF-receptor blocker to begin with. They will be in trials in the near future, and it would be much better to see if THEY can have success. » I didn’t see wnt or lithium mentioned in the new patent. I didn’t see lithium mentioned, but Wnt is mentioned a few times. They also mention that oral consumption of these drugs may suffice as well, which is kind of cool. Br J Dermatol. 2007 May;156(5):1087-8. Epub 2007 Mar 28. An unusual terminal hair growth on the nose tip associated with gefitinib therapy. J Am Acad Dermatol. 2008 Apr;58(4):642-3. Epidermal growth factor receptor inhibitors and hair. Lastly, they mention leflunomide, which is a drug used to treat arthritis, but it also has anti-EGF properties. It’s also a hell of a lot cheaper than gefitinib, erlotinib, etc. FEBS Lett. 1993 Nov 15;334(2):161-4. Inhibition of the epidermal growth factor receptor tyrosine kinase activity by leflunomide. "(b) contacting the cells of said skin with an EGFR antibody in an amount sufficient to generate hair follicles or stimulate hair growth on said skin. The method of claim 58, wherein said EGFR antibody is selected from zalutumumab, cetuximab, IMC 11F8, matuzumab, SC 100, ALT 110, PX 1032, BMS599626, MDX 214, and PX 1041." Unfortunately, these EGF antibodies are disgustingly expensive. One round of cancer treatment with cetuximab, for example, costs $30,000. They are given intravenously, BTW. If Follica uses these drugs, maybe the topical dose will be small, thus substantially reducing the cost. What is wrong with going for it? I wound myself all the time bucking hay on the farm (constantly cutting my arms, come to think of it, I have hairy arms;-) With all of the worthless things we have all tried before, why not experiment with this? What are the dangers? Someone may come up with something that they claim works. We could try it ourselves just like everyone does with minox, emu, diet, etc and tweak it. Your thoughts? Personally I don’t see a lot of potential danger beyond maybe a messed-up dermabrasion (and maybe an infection at the skin site from that). There are concerns about the WNT pathways & cancer being voiced on here from time to time. But I get the feeling that Follica itself isn’t gonna do any more work to assure safety in this area anyway. If this is the case, then I don’t think messing around with this process on our own would really be any more dangerous than getting the final legit commercial treatment from Follica. But if we’re gonna mess with it, then please . . . let’s stay clear about what is a real new discovery and what isn’t. And let’s get some pics and stay clear about what is “major” regrowth. If Follica is gonna be the real holy grail HM that we’ve all been waiting decades for, then the results shouldn’t need to be viewed with the kind of tragically-lowered expectations that we’re used to. I don’t wanna know about another complicated & expensive way to regrow some little new vellus sprouts on 5-10% of my most recently-lost hairs. I wanna know whether this Follica deal is REALLY gonna solve the world’s MPB problems once and for all. experimentation is pointless if one cannot get a hold of $2500 dollar per month egf-receptor blocking drugs or cyclosporin…and since we cant and they are in the patent, one would be trusting mere luck to regrow a hair or two in all probability. Most importantly…most of the population would not know what they are doing and their scientific understanding would cause them to screw something up in the procss…wasting their own time. Follica is going to be testing this soon. Also…we really dont know if it works in human beings yet or not. Follica hasn’t tried it yet in people either. » Br J Dermatol. 2007 May;156(5):1087-8. Epub 2007 Mar 28. » J Am Acad Dermatol. 2008 Apr;58(4):642-3. » Epidermal growth factor receptor inhibitors and hair. » cheaper than gefitinib, erlotinib, etc. How much are gefitinib etc. I think I could get cyclosporin for a reasonable ammount from an Indian pharmacy so some of these might not be outrageous. As for antibodies - forget it. » FEBS Lett. 1993 Nov 15;334(2):161-4. » Department of Immunology, Johannes Gutenberg University, Mainz, Germany. » of a variety of mammalian cell lines in culture. That would be cool if it wasnt the active metabolite that had the properties. Oh well. Interesting what they say about mice hairs being destroyed by an inflammatory infiltrate. Mice that have been altered so as to have hairs that are “unable” to go into catagen seem to go bald as often as those that have growth promoters knocked out. This is the first time I have heard an immune response cited as the reason why this is the case. Available online 14 March 2008. Dialogues in Dermatology, a monthly audio program from the American Academy of Dermatology, contains discussions between dermatologists on timely topics. Commentaries from Dialogues Editor-in-Chief Warren R. Heymann, MD, are provided after each discussion as a topic summary and are provided here as a special service to readers of the Journal of the American Academy of Dermatology. Targeted antineoplastic therapies are being increasingly utilized by oncologists for a variety of tumors for patients in whom standard chemotherapy has failed or cannot be tolerated. These agents affect signal transduction pathways that may be overexpressed in tumors but are also expressed in the skin, thereby leading to adverse cutaneous reactions. In this dialogue, Dr Myskowski details the dermatologic findings seen in patients who have received inhibitors of the epidermal growth factor receptor (EGFR) and multiple kinase inhibitors that inhibit vascular endothelial growth factor (VEGF) and platelet derived growth factor (PDGF). This commentary will discuss the EGFR inhibitors, focusing on their effect on hair. Considering how common the follicular eruption is with these drugs, the paucity of reports of alopecia with these agents is surprising. Graves et al5 report the case of 65-year-old woman with non–small cell lung cancer treated with gefitinib for 2 years. In addition to chronic paronychia and perifollicular papules and pustules on her arms, she developed a patchy, nonscarring alopecia on the crown of her scalp. All of her cutaneous findings improved after gefitinib was discontinued. EGFR inhibitors may affect hair growth and texture. Van Doorn et al4 described two patients, both of whom noted that the hair became curly, fine, and brittle within weeks of administration of gefitinib. These changes were appreciated on the scalp of one patient and on the extremities in the other. Changes in eyelashes and eyebrows are not uncommon. Pascual et al6 reported that a 51-year-old woman with a history of an adenocarcinoma of the lung noted a marked increase in the length of her eyelashes 7 weeks after commencing treatment with gefitinib. She also developed an acneiform eruption.6 Lane and Goldstein7 describe the case of a 70-year-old woman who presented with a corneal ulcer resulting from aberrant and exuberant eyelash growth. This complication may be avoided by trimming the eyelashes in patients in whom eyelash trichomegaly is observed. William Montagna, PhD, the celebrated skin biologist, was quoted in the New York Herald Tribune on April 11, 1963 as follows: “Interest in hair today has grown to proportions of a fetish. Think of the many loving ways in which advertisements refer to scalp hair—satiny, glowing, shimmering, breathing, living. Living indeed! It is as dead as rope.” Even if hair itself is not alive, the hair follicle certainly is, and aberrations in its structure and function may have detrimental effects. As more is learned about EGFR inhibitors and their effect on the follicular epithelium, perhaps new insights will enable researchers to develop novel treatments for alopecia, hirsutism, and inflammatory disorders of the pilosebaceous unit. In the interim, dermatologists need to be familiar with the adverse reactions of these agents, because they will be encountered in our practices with increasing frequency.